Prince Wenzel von Metternich, 1832. The narrator of my novel, The Scandalous Life of Sasha Torte, was named in honour of a very famous cake. Sasha Torte is a world-class Tasmanian pastry chef and she establishes her magnificent cake emporium in Wolfftown, a fictional maritime port on the wild, wild West Coast of Tasmania. I came up with the name Sasha Torte while gazing at a very elegant chocolate cake perched on its own silver stand in an expensive, chic cake shop. I recognized it as a Sacha-Torte and it spoke to me of fantastical creations and great temptations. The Viennese take their cakes very seriously and in the early twentieth century legal battles were fought to decide who’d originally created the Sacher-Torte. Apparently the ‘original’ Sacher-Torte glaze contains a blend of three premium chocolates made exclusively for the torte. Cake historians believe that in 1832 Prince Wenzel von Metternich, ordered his chef to create an exceptional dessert for his very important guests. And then disaster struck. The Prince’s chef became ill and a nervous sixteen-year-old apprentice was hauled into the kitchen to take over. The Prince is reported to have declared: ‘Let there be no shame on me tonight!’ There wasn’t. Prince Wenzel von Metternich’s guests gleefully devoured what later became known as a Sacher-Torte. And young Franz Sacher not only survived his ordeal but went on to become an accomplished chef. So what exactly is a Sacha-Torte? Franz Sacher created a simple concoction of luscious rich chocolate cake, bonded with sweet apricot preserve and slathered in chocolate icing. Much later his recipe was further refined by his eldest son, Eduard Sacher. Some pastry chefs insist that the trick to achieving a suitably glossy icing, comes down to getting the temperature right and by only using the very best chocolate. The ebony glaze (schokoladeglasur) is smoothed over an underlayer of apricot jam. This enables the schokoladeglasur to remain glossy at any temperature. It’s been written that Eduard Sacher initially made his pile in a tavern that provided private rooms, enabling wealthy men to have discreet assignations with ladies of ‘light virtue’. These rooms – known to Parisians as Chambre separées – may also have been a feature of the luxurious Hotel Sacher that Eduard successfully established in 1876 in Vienna. 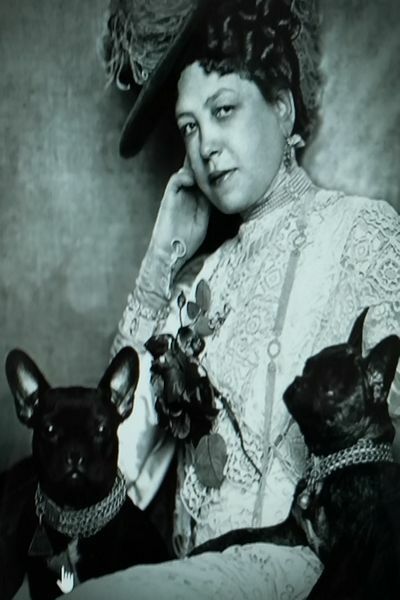 Eduard’s wife, Anna Maria Sacher, (photograph above) was the daughter of a butcher who quickly acquired a taste for expensive cigars and French bulldogs. She indulged excessively in both. Unfortunately, Eduard died young leaving his magnificent hotel in the very capable hands of his wife. Historians have claimed that the Emperor Franz Joseph refused to set foot in the hotel, because he regarded the Hotel Sacha as nothing more than a high-class brothel. Sadly this suggests that the Emperor denied himself the hotel’s specialities including the delectable Sacher-Torte. The hotel has retained its magnificence and it still serves Sacha-Tortes. So sought after is the original Sacher-Torte, that the Hotel Sacher produces nearly 400,000 cakes a year, packages them beautifully and then sends them around the globe. The French, Germans, Italians, Americans and several Asian countries are deeply enamoured with the original Sacha-Torte. I think it’s wonderful that a simple but elegant chocolate cake – created nearly two centuries ago by a young kitchen apprentice – has attained cult status globally.